Moreover, those 8 years include the first appearances of every major Golden-Age Flash villain. 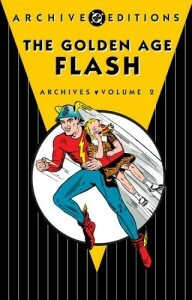 The current 2 volumes of The Golden Age Flash Archives only make it through Flash Comics #24 and All-Flash #2. The Shade, the first real supervillain to grace the series’ pages, didn’t appear until Flash Comics #33. The Fiddler, the Thinker, the Turtle, the Rag Doll—even the original Rose & Thorn and Star Sapphire all made their appearances during those years, and haven’t shown up in the archives yet. In fact, the only Golden-Age villain to get the archive treatment for his original appearances is the Rival, who showed up in Flash Comics #104 (the final issue of the series), and whose story was (oddly) included in the silver-age Flash Archives vol. 1. Even when you factor in the golden-age stories that got reprinted in later Flash books, the “Greatest Stories” collections, and the occasional anthology series like DC Super-Stars, 75% of the stories have never been reprinted* since the 1940s. I’ve been looking for Golden-Age issues for almost 2 years now, and by focusing on All-Flash (which typically included 3–4 short stories or 1 long one), I’ve managed to hit 50%. It’s gotten harder, largely because I’m less willing to pay the big bucks for random issues than for issues with specific characters. Now, there is of course a question of whether there’s a demand for the material at all…but when a beat-up reader’s copy of a book goes for more than the archive would cost on Amazon, I’d say there’s no risk that the availability of back issues will interfere with the market for the archive. *104 stories in Flash Comics, 1 in the Flash Comics Miniature edition, 29 in Comic Cavalcade, 71 stories in 32 issues of All-Flash, 3 completed but unpublished until years later = 208 total. Of those, 32 have appeared in the GA Flash and Comic Cavalcade Archives, 1 in the Silver Age Flash Archives, and another 16 in various other books. Just 49 out of 208. Only 23.5% It’s a little harder to go by issues instead of stories, since some issues of All-Flash have only partially been reprinted, but it seems to be roughly 41 out of 169 — which works out to 24.3%.